St. Martin's Griffin, 9781250153258, 288pp. The Animal Lover's Guide to Changing the World is the inspiring, accessible, and empowering book for everyone who loves animals and wants to live a more animal-friendly life, even if they aren’t ready to join a movement or give up bacon. With more than 7.5 billion people on the planet, wildlife is going extinct at the fastest rate since the dinosaurs. Three to four million dogs and cats are killed in shelters every year; billions of chickens, pigs, and cows are killed for food; and countless animals are killed in research labs or their habitat. The numbers are daunting, but there’s good news too! Even one person truly can make a difference without breaking the bank. 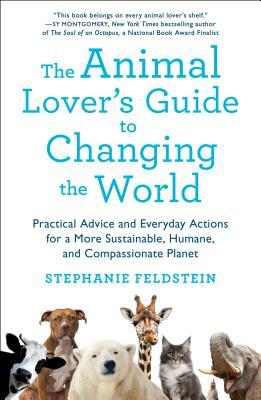 With Stephanie Feldstein's straightforward and encouraging guidance, readers will learn how to take action to create a better world for the animals we love. It starts with changes as simple as taking a shorter shower, skipping meat once a week, wearing "this" not "that," and extends all the way to online activism and politics. The animals need us; so let's get on with some world changing! Stephanie Feldstein is the Population and Sustainability Director at the Center for Biological Diversity, where she heads a national program that addresses the connection between human population growth, overconsumption, and the wildlife extinction crisis. She created the innovative Take Extinction Off Your Plate campaign, and her work has been featured in The Huffington Post, NPR, Salon, The Guardian, The Washington Post, and more.